A job is a specific position or work for which you get paid. Example: an engineering technician at XYZ Company. An occupation is a type of job with the same job duties. People who work in an occupation do similar tasks and need similar training. Example: physicians, teachers, or scientists. A career is a journey that lasts your whole life. Sometimes, it is called a “career path.” As you work in jobs, you build skills, knowledge, and experiences. Your career includes education, training, work experience, and community involvement. It also includes unpaid work and hobbies. 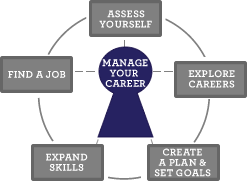 Part of managing career means that you think about what you need to do to improve or move up. You stay current in your skills and knowledge. Setting goals helps you move from a bunch of jobs to a career. Successful people usually set short- and long-term goals. They think about what they can do now to achieve their goals in the future. What’s the difference between an occupation and an industry? Your occupation is what you do, or a type of job. Your industry is where you do it, or a type of business. A janitor is an occupation that is found in most industries. Health care is an industry that employs many occupations. You can find doctors, accountants, and janitors in health care. You need to know the difference between occupations and industries. It will help you know what type of work you want to do, and where you want to work. It will also help you know how you can prepare for that work. Plus, you will be better at your job search. Create a Plan & Set Goals will help you plan for the future.